The other day, I realized I had a package of won ton wrappers in the fridge that would expire soon. Maybe it was the subtle hint of a change of seasons, maybe I was just living on the wild side, but I decided to make potstickers that had nothing whatsoever to do with Asian flavors. After all, potstickers are essentially ravioli. Some cooks even use won ton wrappers in place of pasta to make their own ravioli. So I abandoned the teriyaki and ginger and headed toward the Mediterranean. Instead of tomato sauce, I set a red pepper sauce on to simmer. The base was a vaguely Italian version of a mirepoix: onions, garlic, and Fresno chiles. Here’s the key: added to that base of Italian mirepoix was a smidgen of tomato paste and anchovy paste. Do not leave these out. I forgot both of these essential ingredients the second time I made the sauce, and it was abundantly clear that something crucial was missing. I have anchovy paste and tomato paste in tubes that live in my fridge. They last forever (which translates as “several months”), and add that umami depth to the sauce. If you add them at the beginning, they are unidentifiable. Without them, the sauce is one-dimensional. I used cannellini (white kidney) beans for the filling because they are my favorite beans. They’re unbelievably creamy in texture. The filling will also be tasty with kidney beans or Great Northern beans, or even garbanzos, which will have a grainier texture but a terrific nutty flavor. Chicken andouille is spicy and richly flavored, but by all means use the original pork version if you prefer. For a vegetarian potsticker, leave the sausage out and double up on the onion, garlic, and peppers. Pour about 2 tsp. oil in a nonstick skillet and place over medium heat. Add the onion, garlic and chiles (or bell pepper). Sprinkle lightly with salt and pepper and sauté for 5 to 7 minutes until tender and lightly browned. Scrape roughly half the onion mixture into a small saucepan over medium-low heat. Add the anchovy paste and tomato paste and cook for a few minutes. Add the roasted red peppers, 1/2 cup of the stock, and the vinegar. Give a stir and leave alone to simmer. Meanwhile, add the sausage to the skillet with the remaining onion mixture. Sauté over medium heat until lightly browned. (I used cooked chicken andouille; if you use raw pork andouille, crumble it into the pan and sauté until cooked through.) Add the drained beans and 1/2 cup of the stock. Simmer and mash most of the beans with a potato masher or the back of a fork. Season to taste with salt and pepper. Add a few tablespoons more stock if the mixture seems dry. You want a thick, moist paste. Purée the red pepper sauce with a stick blender, food processor, or regular blender. (I used the stick blender and left my sauce chunky.) Taste and adjust seasoning. Return to the heat and keep on low. Fill a small bowl with water. Dip your finger in the water and moisten all the edges of one won ton wrapper. Place a rounded tablespoon of filling in the center of the wrapper. Bring opposite corners together and pinch firmly. Proceed down one side, pinching and pleating toward the center as you go. Pleat and pinch the second side until the whole potsticker is tightly sealed. Place on a tray or cutting board and proceed with the remaining wrappers and filling. Set two large nonstick pans over medium-high heat. You’ll need to cover the pans, so use ones that have lids, or cook the potstickers in batches. Divide the remaining oil between the pans. When the pans are hot but not smoking, place the potstickers in each pan flat side down, leaving a little space between each one. Cook for about 5 minutes until the bottoms are nicely browned. Pour about 1/2 cup stock in each pan, enough to just cover the bottoms of the pans, and slap those lids on fast. Cook for 5 minutes until the wrappers are tender and the liquid is evaporated. Remove the lids and cook for a few more minutes until the bottoms crisp up. Serve right away. If you like more crispness, flip the potstickers on their sides and brown for a few minutes longer. Serve with the warm red pepper sauce. This entry was posted in appetizers, main courses and tagged beans, potstickers, red pepper, sausage, won ton wrappers. Bookmark the permalink. fabulous creation. 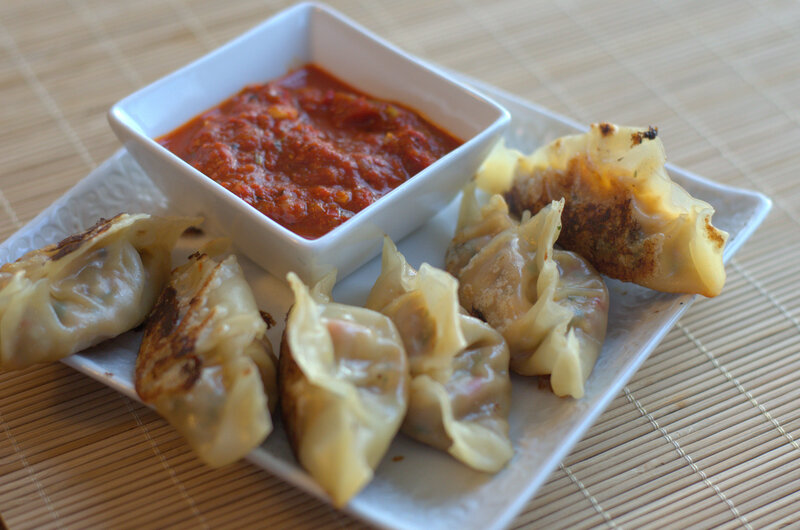 i love the idea of doing a fusion potsticker and turning it into an italian treat. the possibilities with this are endless!